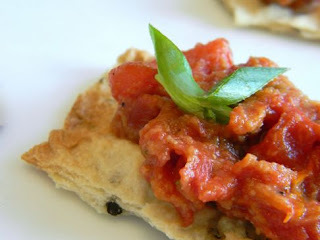 Caramelized Tomato and Courvoisier Canapes (Toast Topper #5 and a #CVCollective Competition Entry!) | What Smells So Good? After a long day (or week) at work, have you ever sat back in a favourite armchair, with the fireplace lit, dog at your feet, favourite book in one hand and snifter of cognac in the other? Me neither, but while that imagery is the stuff of stories (or at least long-ago life), the elegance of a well made, tawny amber glass of cognac is a living legend. Cognac itself is an elite drink: the A.O.C. name can only be given to brandy made from Colombard, Folle Blanche, Jurançon blanc, Meslier Saint-François, Montils, Sémillon, or Ugni Blanc grapes, which is then distilled twice in copper pots and aged at least two years in French oak. The origin of our history goes back to the beginning of the 19th century with Emmanuel Courvoisier and his associate, Louis Gallois, running a wine and spirit merchant company, in the Parisian suburb of Bercy. In 1811 Napoleon visited their warehouses in Bercy and he was hosted by Louis Gallois, the Mayor, and Emmanuel Courvoisier. Legend has it that Napoleon I later took several barrels of cognac with him to St Helena, a treat much Courvoisier varieappreciated by the English officers on the ship who named it 'The Cognac of Napoleon'. It is this infamous, old-world producer of the spirit that is launching a competition to discover the top Courvoisier cooks in Ontario. Both culinary students and home cooks are being invited by the company to create and submit their best recipe with one of the ties. Until August 24, Ontario cooks can log on to the Courvoisier Collective website and share their creations. On September 7th, a panel of chefs will choose three finalists in each of the student and home cook categories to showcase their creations at a special event on October 17 in Toronto. The final winner will receive $1,000 and all entries will be eligible for the People's Choice Award (selected by online votes). Even though I can't drink, I do cook with a good range of alcohol. Cognac, however, was not one of the ones on my repertoire until now! I devised a light, yet richly flavoured hors d'oeuvre recipe that showcased not only the cognac in "raw" and "baked" applications, but the beauty of the Summer's produce as well. Fresh herbs and tomatoes roast into a caramelly spread, lemon and green onion add a touch of brightness, ground almonds and breadcrumbs add thickness and body and a twist of Courvoisier VS roaked raisins adds a touch of sweetness and exoticism. Spread onto homemade, black pepper and sea salt crispbread, it's an elegant appetizer you can also keep all to yourself! Note: The topping takes a day to steep, and tastes better done a few days in advance. The crisps are best done the day of serving although they will keep 1-2 days. In a large bowl, combine flour, raw sugar, salt and pepper. Add the olive oil, Courvoisier VS and just enough water to form a stiff but sticky dough. Turn mixture out onto a cornstarch-dusted counter, knead briefly and form into a ball. Divide dough in half and let rest 15 minutes (uncovered). Working with one portion at a time, Place on a sheet of parchment dusted generously with cornstarch and roll until paper-thin. Transfer the parchment to a baking sheet. Repeat wth remaining dough and another sheet of parchment. Bake, 1 sheet at a time, for 15 minutes, rotating sheet after 7 minutes. Once cool, break into "rustic", uneven pieces. Crisps can be stored in an airtight container up to 2 days. In a small container, combine raisins and Courvoisier VS. Cover and let steep overnight. Preheat oven to 350°F and lightly oil a baking sheet. Place the tomatoes, cut side up, on the sheet and sprinkle with salt and pepper. Drizzle with the olive oil. Remove from the oven and sprinkle with raw sugar, thyme and rosemary. Return to the oven and roast a further 10 minutes. Let cool 10 minutes, then scrape the entire pan contents into a blender or small food processor and add the raisins (with liquid), lemon zest, ground almonds, breadcrumbs and green onion. Puree until smooth and thick. Let cool, then scrape into a bowl and chill before serving. Place 1-2 tsp of the Caramelized Tomato Topping on top of each crisp. Garnish with green onion. Serve within 3 hours of assembly. Aroma: fruity, slightly sweet, young oak and smell of alcohol. Taste: a little spicy at first, but soon after soft palate with sweet, fruity and floral tones. By using new oak barrels, there is a strong woody flavor perceptible. After-taste: short, intense, sharp and very powerful. Origin: mainly Finnish but also Bois Grande Champagne, Petite Champagne and Borderies.